SANTA ANA, Calif. /California Newswire/ — "This is an exceptional exhibit, one that offers deeply personal work from photographers launching new themes," noted Bob Killen, the fine art program leader for Calumet University, the education and events division of Calumet Photographic which hosts the Calumet Gallery. Calumet Photographic's Santa Ana Store, 1430 S. Village Way, Santa Ana, CA 92705, will host the exhibit in their Gallery Room from April 26 – May 26. "We will also host a public Artists Reception, from 5:30 p.m. to 8 p.m. on April 26 with an artist talk at 6:30," said Mark Jenkins, General Manager. "This is a unique opportunity to view and own new, emerging voices that are exploring new themes." "The graduates, Gizella Nyquist, Pamela Lagoni, and Dave Nelson, explored deeply significant themes," said Killen. "In these artists' work, one quickly feels the extended emotional range and recognizes the personal voices each has brought to their work." David Nelson delivers a thematic project that explores "Gian"' commercial signs and business friendly sculptures from Southern California's boom years. These huge "sky-punching" works of neon, steel, and plastic are iconic metaphors that testify to the egos that drove the urban sprawl and rapid unchecked development. Pamela Lagoni explores mechanical detail with robust images of gears, spokes, and clutches, each of them rendered with an 'in-close' perspective. Her prints draw viewers into a world of images that present the hard edges of power works as well as the soft glamour of chrome and candy apple paints. Gizella Nyquist presents an inventive exploration of form and structure derived from her study of tree bark, the California Sycamore specifically. Her eye for detail at one level and her sense of the grander meaning of nature at another pushed her to explore various forms "Hidden Within" the rich textures and colors of the bark. "While the subject matter is unique to each of these artists, the unifying power of light binds them into a common text of uncommon views that explores work that is a vision beyond documentation," Killen pointed out. 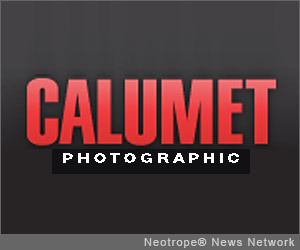 "This level of work," Jenkins said, "is indicative of the depth and breadth of photography exhibits that Calumet is proud to present and to help develop. We invite the public to share time with the artists at our wine/cheese reception and review the new work."